Protesters were arrested and removed from a hearing at the US Capitol on Tuesday. The Rules Committee was considering legislation that reforms the Americans with Disabilities Act, which the House is slated to vote on this week. 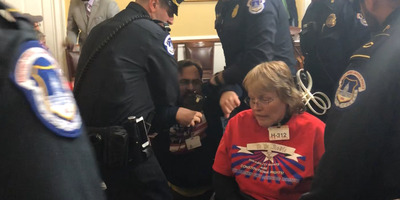 WASHINGTON – Demonstrators interrupting a hearing in the House Rules Committee to protest reforms to the Americans with Disabilities Act were arrested and dragged out of the room inside the US Capitol on Tuesday. Several protesters who require wheelchairs were forcibly removed from the hearing room just outside the House chamber. Videos posted on social media show the incident as it unfolded. Demonstrators can be seen chanting as law-enforcement officers drag them out of the room. After the protesters were removed, US Capitol Police began threatening one woman with additional charges of resisting arrest for not moving her wheelchair. The woman’s hands were handcuffed together with zip ties and she was unable to move her manual wheelchair. Police also informed reporters watching that taking video or photographs inside the Capitol hallway was prohibited. The protesters took issue with the House Rules Committee considering the ADA Education and Reform Act, which alters the landmark 1990 law so that individuals claiming disability-related discrimination would have to notify companies in writing, with new correspondence and response times attached.